A great range of various bells and chimes including authentic Indian ankle bells, Nepalese Buddhist ghanta bells and a selection of tinkling dreamchimes in a multitude of sizes. We also have some lovely, space clearing aura chimes, perfect for Feng Shui and holistic practices. 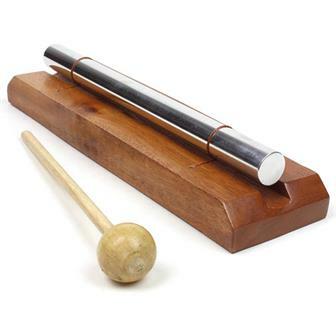 Aura chimes are primarily used in sound therapy to clear negative energy. A person's aura can be adversely affected if there is an imbalance in the energy flow, thus causing a build up of dense and negative energy. 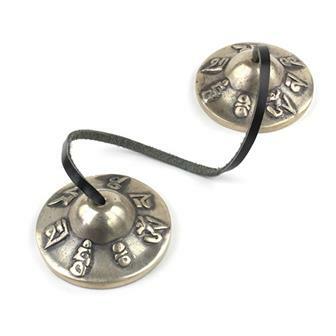 The smooth, penetrating tone of the aura chime eases tension and can slowly remove dense, negative energy. Aura chimes are also used in a similar way for the "space - clearing" of rooms. 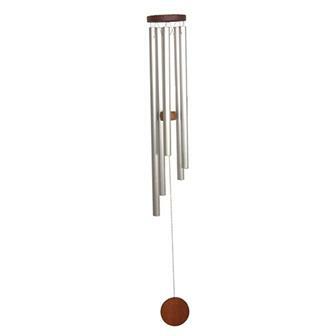 These fantastic aura chimes have a large carved wooden base with eight solid metal chimes suspended above it to produce an excellent item for sound therapy and space clearing. Supplied with wooden beater. 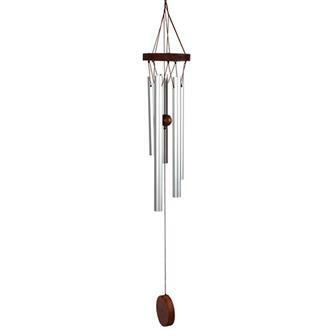 Lovely sounding metal ornament, this windchime has a internally housed set of chimes that produce very soft sounds in the breeze. 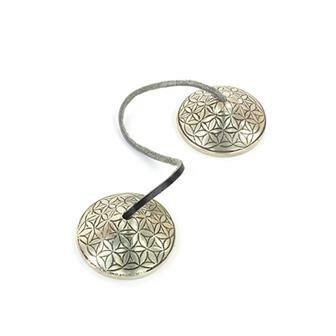 The chimes body is decorated with a simple embossed pattern and the clapper is a heart shape. 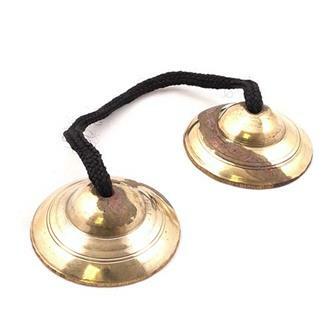 Tingsa or Tingsha are two small cymbals that are used by Buddhists during offerings, prayer and meditation. The cymbals are generally joined together by a cotton strap and produce a clear, high pitched ringing tone when struck together. Special version with non leather strap and white cotton bag. 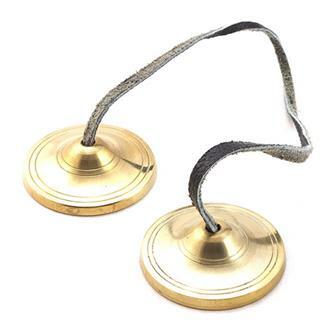 Tingsa or Tingsha are two small cymbals that are used by Buddhists during offerings, prayer and meditation. This pair depict the 'Om Mani Padme Hum' design, the most commonly seen mantra in Buddhism. 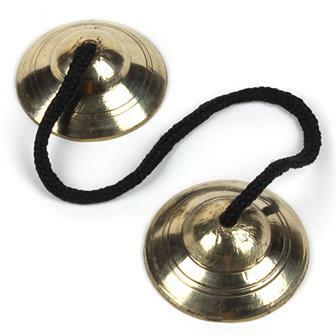 Tingsa or Tingsha are two small cymbals that are used by Buddhists during offerings, prayer and meditation. This pair depicts the 'Naga' design, an image of a serpent/dragon that appears throughout Buddhism. 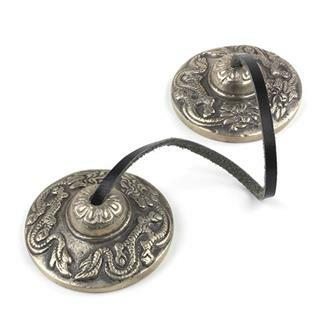 Tingsa or Tingsha are two small cymbals that are used by Buddhists during offerings, prayer and meditation. This pair depicts the 'Tashi Tag Gye,' the eight auspicious symbols of Buddhism. 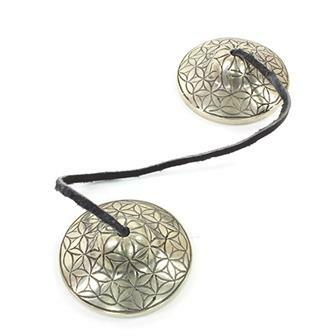 Pair of metal cymbals cast with a delightful flower of life geometric design and strung on chunky leather strap. 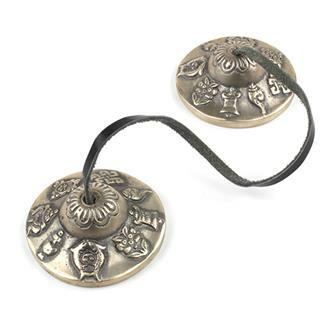 Tingsa or Tingsha are two small cymbals that are used by Buddhists during offerings, prayer and meditation. 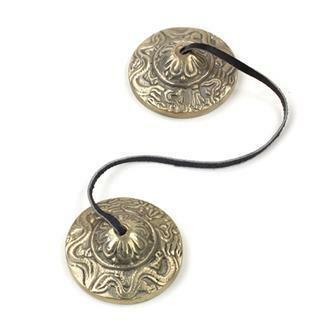 Tingsa are two small cymbals that are used by Buddhists during offerings, prayer and meditation. The cymbals are generally joined together by a leather strap and produce a clear, high pitched ringing tone when struck together. Simple but elegant shiny chimes on chunky leather cord. These pair of chimes produce a soothing long tone when struck and are available at a great budget price. The manjïrà is a traditional percussion instrument of India. 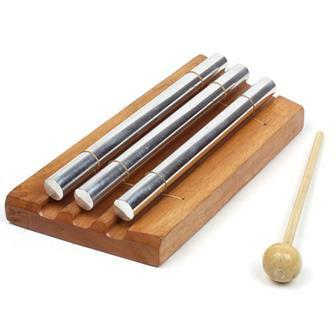 These simple chimes are often used in folk and devotional music, particularly in Gujarati and Marathi traditions. The chimes are hit together to create a high pitched, tinkling sound, used as an accompaniment to a larger ensemble. These chimes have arrived to our warehouse with tarnished metal. Although the sound is still very good, they are cosmetically damaged and are being sold at a cheaper price. This charming little set of chimes are perfect for hanging in the garden to catch the wind and create beautiful tinkling tones. This wonderful set of metal windchimes are designed to knock gently together in the wind, sending forth elegant, soothing tones. Perfect for enjoying in the garden. 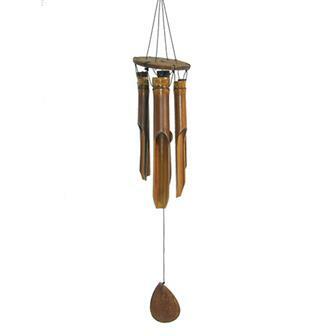 These lovely medium windchimes are handmade in Indonesia from fast growing, sustainable bamboo. As the wind blows, the bevelled sections knock together and against the central wooden striker creating a gentle, pleasing tone. The perfect sounding item for relaxing on a sunny day in the garden. 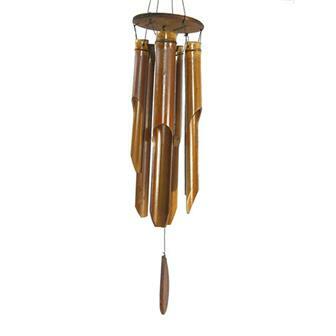 These lovely large windchimes are handmade in Indonesia from fast growing, sustainable bamboo. As the wind blows, the bevelled sections knock together and against the central wooden striker creating a gentle, pleasing tone. The perfect sounding item for relaxing on a sunny day in the garden. 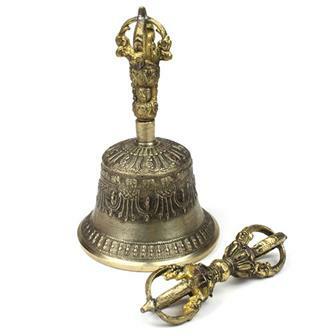 This bell, known as a ghanta in Buddhism, represents the female principle which symbolises wisdom and purpose. 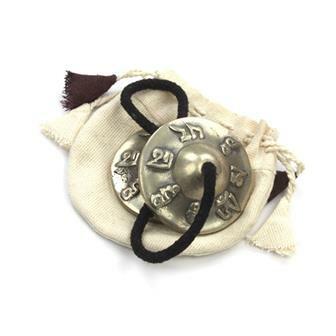 This bell comes with a Vajra, known as a Dorje in Tibet. It is a tantric symbol for the absolute, beyond all opposites and the union of the spiritual and material world. This bell is known as a ghanta in Buddhism and it represents the female principle which symbolises wisdom and purpose. 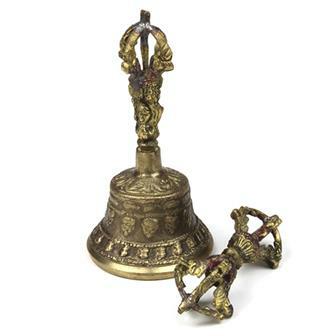 This bell comes with a Vajra, known as a Dorje in Tibet. It is a tantric symbol for the absolute, beyond all opposites and the union of the spiritual and material world.